The master of The Forst Time sounds a whole lot different than on the 70's box set, with more choir and a "fatter" sound. Could this be the 45 rpm mix? Nice to get something "new" when not expected. I also like that Lady Madonna is twenty seconds longer. A shame he didn't record it properly! You're right, Anton! Funny I didn't recognise it. Well, it was nice to hear it again. Do you know where the other version first appeared? Quite a difficult release to sum up in many ways . The original album was released as a consequence of Elvis' aborted attempt (owing to eye trouble) to record a country-folk album from March-May 71 and to offer some non-Christmas and religious material into the release schedule. Having said that, it was a very odd decision to release one of the best 70's Gospels songs on this - Put Your Hand In The Hand really should have been saved for He Touched Me with that album suffering as a consequence. Likewise, I Was Born About 10,000 Years Ago(if it was to be released in full)-these instead of garbage like There Is No God But God or He Is My Everything would have transformed HTM. Back to Elvis Now - the third gospel, Miracle Of The Rosary is odd and far from 'top drawer'- basically Hail Mary set to music, a bad idea despite Elvis' incredible sincerity and excellent performance. 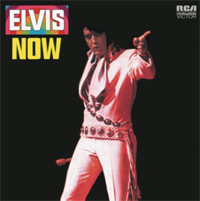 Other dross on the original release - Sylvia(where Elvis makes no attempt at the high notes), Fools Rush In (a remake of Ricky Nelson's version for no apparent reason other than as the out-takes here show, Elvis really seemed to enjoy singing it). Contrary to most people, I’ve always liked Hey Jude - yes, as often, he never learnt the whole song but this is a really fascinating performance, showing Elvis’ ability to transform a song by giving it a completely different treatment. We Can Make The Morning never seemed to fulfil its potential, bits are great but the multitude of voices just ruin it. Help Me Make It Through The Night was spoilt by the overdone backing ruining Elvis' great fragile interpretation - if only Kris K. had finished this by June 70! The outtakes are much better. Elvis was probably more familiar with Neil Diamond's or Glen Campbell's versions of Until Its Time For You To Go than the original and although recorded since by a myriad of people, Elvis' remains my favourite version, indeed both of Elvis' versions! The outtakes here are even better than the masters! The First Time Ever I Saw Your Face, is not remotely the performance Elvis could have given this great song; yes, there is some mitigation in the difficulties recording it (shame the duets weren't included here) but this is not fit to be compared with Roberta Flack's version or indeed many of the versions eg Johhny Cash's, it’s appears rushed and badly arranged, much too fast with awful intrusive backing harmonies. Elvis should have sung it in the style of I Will Be True and It’s Still Here. Additions to the original album:I'm Leaving is simply one of the best things Elvis did in the 70s, maybe ever - it is breathtaking in every way, as indeed are the out-takes included here, the highlight of the album – albeit take 3 has been released before on I Sing All Kinds. I absolutely adore Don't Think Twice...but this clearly isn’t the full version, I believe that clocks in at 13 minutes, and yes it should have been included here. Its Only Love, a cover of a BJ Thomas song, and as always, Elvis is light years better - although, to me, take 9 is better than the master (take 10). The other out-takes don't add much to what we already have, indeed many have been released on FTD before (though now deleted). As for the other non-Xmas and religious material recorded in March and May 71, these are obviously going to appear somewhere else - maybe a FTD version of Fool, but with Don’t Think Twice here, other than a couple of songs, Fool represents the worst of Elvis’ studio output (well tied with some of the Raised On Rock stuff!) As ever given contractual arrangements, quantity sometimes took precedence over quality, and most of these 'bits and pieces' albums suffered hugely from that and leaving off the singles plus the strangest decisions imaginable in terms of song choices for particular albums. Summing-up, well, incredibly uneven in song quality and Elvis’ level of interest but, nonetheless, highly recommended, especially if you don’t already have the out-takes. Thanks James but my boyfriend actually wrote it - David, who also wrote the Good Times review a while ago. I just posted it on to the site! I agree, great review. Tell David thanks from me! Yours was great too, Thomas!